Having completely trashed the character of the burning bush, Euonymus alatus ‘Compactus’, it is my duty as a helpful, PATH following gardening geek to offer some alternatives. Most of my suggestions will grow in USDA Zone 5b gardens because most of them are currently growing in my garden today. Your mileage may vary depending on the zone you are in and the conditions you garden in. This is one of the most carefree shrubs in my garden, growing to a height of around three feet with no pruning. Plus, it has white bottlebrush shaped blooms in the spring. It does prefer a more acidic soil, but I’m still having good luck with it in my mostly alkaline Indiana garden soil. Many gardeners wouldn’t think of a lilac as a good substitute for burning bush, because the common lilac doesn’t really have fall foliage color. It just sort of fades away as the powdery mildewed leaves drop to the ground. 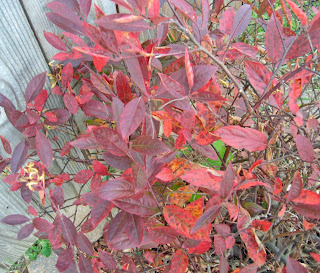 But ‘Miss Kim’ has beautiful maroon fall foliage and it goes without saying that it also blooms in the spring. It seems almost redundant to mention that this shrub, like those I’ve already listed, has white blooms in late spring. Plus it really doesn’t get that big and won’t need much, if any, pruning. Another alternative for red fall foliage is Vaccinium corymbosum, highbush blueberries, suggested by Dwayne in a comment. I would love to grow blueberries but they need acidic soil, much more acidic than is found in my garden. 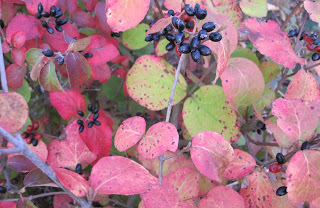 But wouldn’t it be nice to have red fall foliage and blueberries to eat right in your own garden? All of the above, except for the blueberries, are growing in my burning bush free garden and so my recommendations are first hand. 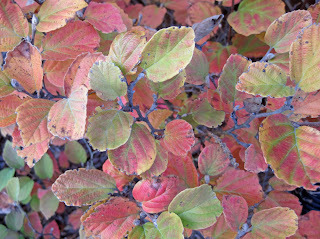 Many thanks to the Hoosier Gardener who also suggested both Virginia Sweetspire and Fothergilla in her comment the other day. As to the invasiveness of burning bush, several readers commented that it is not invasive where they are. That may be true, but it is considered invasive in Indiana and several other states. Please check before you plant and consider one of these alternatives! By the way, the links on the botanical names will take you to the website of the Missouri Botanical Garden's Kemper Center for Home Gardening, an excellent online resource with information on plants for the home landscape if you live in the midwestern part of the United States, and even if you don't. And, this, I believe is my final post on burning bush (maybe). Thank you for these suggestions Carol. I had read the ones from the last post with interest. I have decided that one of my borders needs two medium sized shrubs, so this is good timing. I think Itea virginica ‘Henry’s Garnet’ might make the first list! Great suggestions! Especially love the natives...the Itea has such sweet flowers in the spring. Thanks for all these suggestions, Carol. I've been wanting to plant some new shrubs in a back area, if Hubby ever gets around to pulling out the dead yews back there. I promise I won't plant another burning bush:) Actually, I've never planted one, just inherited them. Thanks for the list of alternatives. I cut down a burning bush 3 years ago and I still find seedlings in the garden. I can easily imagine it taking over a natural habitat. Good choices! I've killed Fothergilla more than 3 times, so that one's out for me, but I'd like to try an Itea. I have one more suggestion to add which is suitable for Zone 5 non-acidic soil, which is bright red - Cotinus coggryia 'Ancot' (Golden Spirit). Thanks for the suggestions! I am currently mulling over a shrub choice, so this is very timely. Fear not, burning bush was not on the list to begin with! I would love to grow blueberries because my kids love them, but it would never happen here without tons of sulfur amending, and I just don't see myself doing that. I need a big shrub (like burning bush size) that would do well with a traditional lilac and a purple smoke bush. That is to say, it would have to be equally vigorous and tolerate dry soil or be willing to fight for its share. It would have western exposure. Any suggestions? Kathy -- I'd look at some of the viburnums, such as the V. trilobum. The link below is the extension office at the Un. of Ill., which lists several viburnum along w/their hort requirements, zone hardiness, size and other attributes. For instance, V. trilobum gets great fall color, has white, lacecap flowers in spring/early summer and red berries in late summer and into fall/winter. Hardy to Zone 2. 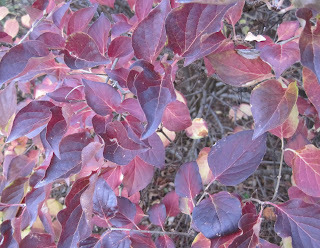 Another one might be V. burkwoodii, but I'm not as certain about its hardiness in your Zone 4.
one thing in burning bush's defense--it does at least have colorful foliage, unlike privet which is real invasive nuisance here (western NC). Actually, I pull both out by the dozen, if not hundred. Gail and Patsy beat me to it... I was going to suggest blueberries! The foliage is outstanding. And the berries, well... *drool* Yum!